China’s first orbital laboratory, Tiangong-1 (“Celestial Palace 1”) is due to re-enter the Earth’s atmosphere within the next 24 hours. Launched in 2011, the 10.4-metre-long (34-foot) unit weighing 8.5 tonnes, was the first phase in China’s project to gain experience in Earth-orbit operations in order to establish a space station in the 2020s. 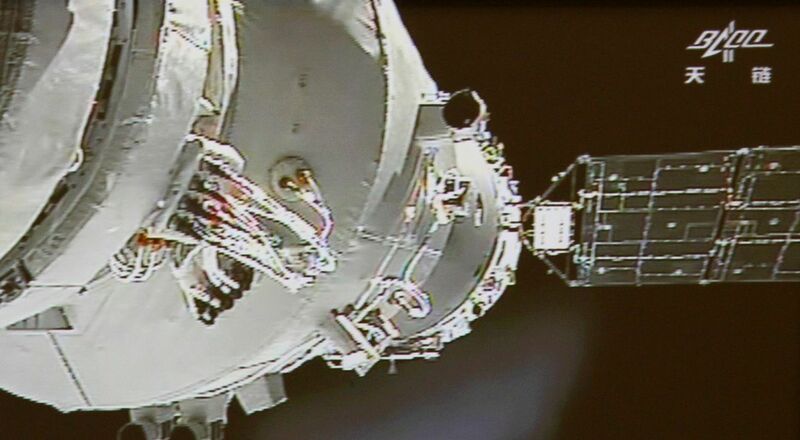 It operated for four-and-a-half-years, and was visited by two crewed missions before operations were officially brought to a close in 2016, following the launch of the Tiangong-2 orbital module. 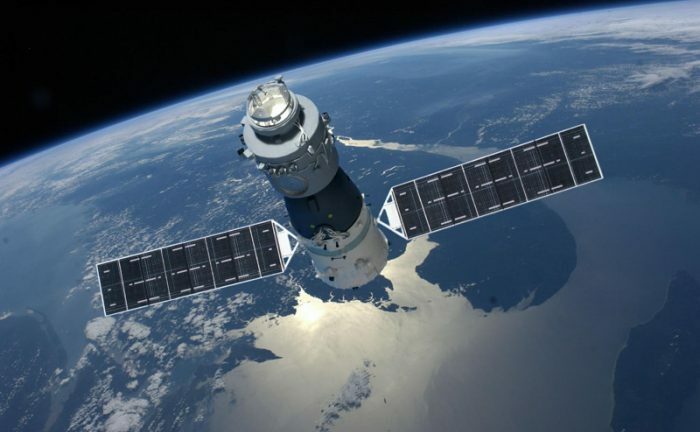 Originally, it had been anticipated that Tiangong-1 would be de-orbited and allowed to burn-up in the upper atmosphere in late 2017. However, it was also claimed that the Chinese had lost attitude control over the unit, and that it would de-orbit some time in March 2018. These claims that control had been lost – strongly denied by the Chinese, led to over-the-top reports that the Earth was in imminent danger of the station forming a fireball and crashing to the ground within a city. While it is true that the unit could re-enter the atmosphere anywhere between 43-degrees north and 43-degrees south, the fact is that much of the laboratory’s orbit takes it over open sea, so the risk than any part of it which might survive re-entry and disintegration in the upper atmosphere could strike a populated centre is considered low. 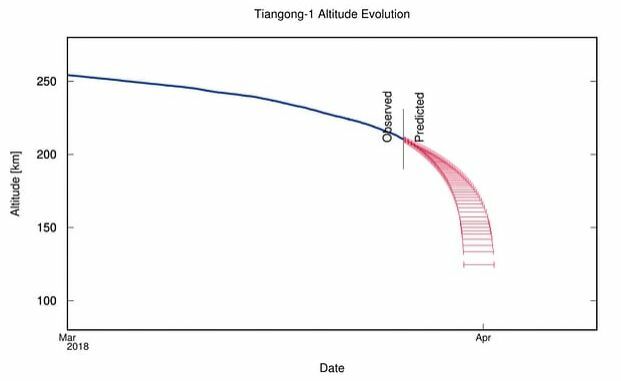 At the time of writing, orbital tracking suggested that Tiangong-1 will re-enter the denser part of Earth’s atmosphere and start to break-up no earlier than 00:18 UTC on Monday, April, 2nd, 2018 (roughly 17:18 EST) +/- 1.7 hours. As Tiangong-1 descends into the atmosphere it will be subject to frictional heat and vibration which will combine to start breaking it apart. As this happens, it is liable it will start tumbling, speeding the process of disintegration and encouraging more of it to burn-up due to frictional heat. The hope is that almost nothing of the station will survive this burn-up process to actually reach the surface of the planet. But even if some do, again, the chances of them hitting a populated area and causing a loss of life appear somewhat remote. In this, Tiangong-1 reflects the US Skylab mission in 1979 and the Russian Salyut 7 / Cosmos 1686 combination of 1991. Both of these where much larger than Tiangong 1 (77 tonnes and 40 tonnes respectively), and made uncontrolled re-entries into Earth’s atmosphere. In both cases, wreckage did not cause loss of life. It’s also worth pointing out that something equal to, or approaching, the size and mass of Tiangong-1 re-enters Earth’s atmosphere approximately every 3 or 4 years – all without harm to those below. Those interested in tracking the laboratory’s orbit in real-time can do so via Aerospace Corporation’s Tiangong-1 re-entry dashboard . The Moon: Gateway or Direct? 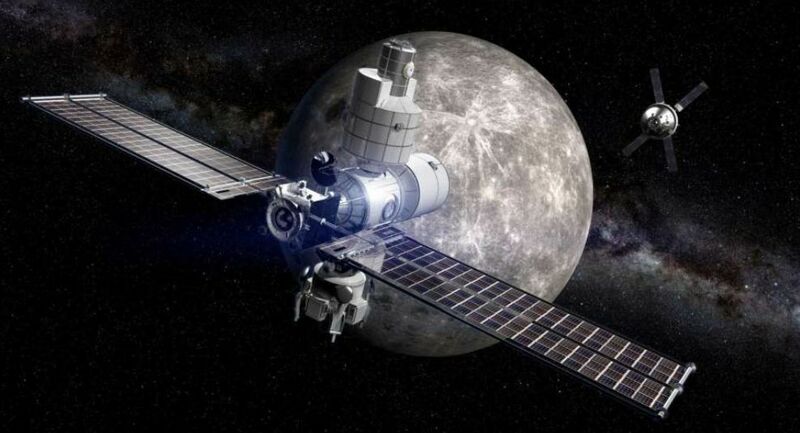 As NASA considers whether or not to acquire more than one propulsion module for the proposed Lunar Orbital Platform-Gateway (LOP-G, previously known as the Deep Space Gateway), more are adding their voices to concern that NASA’s idea of establishing a human presence on the Moon’s surface by way of an orbital facility is not the most ideal way to go. The LOP-G has taken various forms over the course of the last several years. envisaged as a small space station occupying a near-rectilinear halo orbit (NRHO) around the Moon, it was previously known as the Deep Space Gateway, intended to support the (now-cancelled) Asteroid Redirect Mission. It was then seen as a means of supporting lunar missions and – eventually – missions to Mars. The reasons for the station have always been pretty thin, and in an Op-Ed written for Spacenews.com, Robert Zubrin offers an alternative approach to a return to the Moon which forgoes the need for LOP-G.
Zubrin, along with David Baker, is the author of Mars Direct, a proposal for establishing a human presence on Mars. It was conceived in the 1990s in response to NASA’s Space Exploration Initiative of 1989. Also called the 90-Day Report, this sought to set-out a roadmap for reaching Mars. This involved developing orbital facilities around Earth which would in turn allow for a return to the Moon, where large-scale facilities could be built from which humans could embark on missions to Mars. With a 30-year time frame and an estimated cost of US $450 billion, it was a plan built on the specious idea that the Moon offered the “easiest” route to reaching Mars, and which ultimately went nowhere. Mars Direct, on the other hand, presented the means to reach Mars with an initial human mission in just 10 years from inception, and at a cost of some US $30 billion overall. This included all the development costs of the launch vehicle and the required crew infrastructure which, once developed, could be used to undertake subsequent missions (launched every 2 years, to take advantage of Earth’s and Mars’ orbits) at a cost of US $1 billion a year. The mission profile also provided the means to use local resources on Mars to reduce overheads (such as using the Martian atmosphere to produce fuel stocks) and establish a permanent presence on the planet, as well as offering crews an assurance of getting back to Earth if anything went wrong with a particular mission. 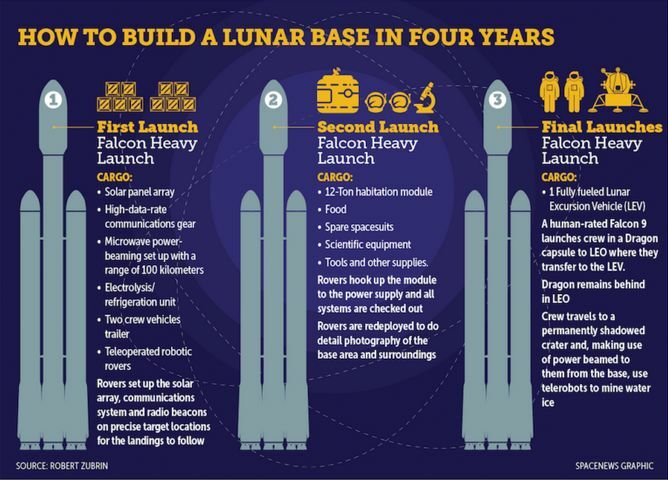 In his Op-Ed, Zubrin suggests a human presence on the Moon could be achieved in four years from inception and possibly for the same overall cost and building the LOP-G.
His idea is centred on the use of the Falcon Heavy launch vehicle, allowing expenditure to be focused on the development and testing of the required lunar hardware. Falcon Heavy can place up to 64 tonne in low Earth orbit, and deliver around 20 tonnes to the surface of the Moon. In his proposal, Zubrin uses three Falcon Heavy launches and a Falcon 9 in order to establish an initial return to the Moon. In the first launch, a Falcon Heavy is used to deliver the following equipment to the lunar surface: solar panel arrays, high-data-rate communications gear, a microwave power-beaming system, an electrolysis/refrigeration unit, two crew vehicles, a trailer, and a number of tele-operated robotic rovers. The latter are used to set-out the solar arrays and communications system, and then scout-out additional landing areas which can be marked by guidance beacons. The second launch – again using a Falcon Heavy – delivers a second cargo lander carrying a 12-ton habitation / laboratory module, fully loaded with food, equipment, tools, general supplies and spare spacesuits. This uses the navigation beacons to touch down at one of the surveyed landing zones. The tele-operated rovers are then used to hook the habitation module up to the power and communications systems, before being re-deployed to start science surveys of the surrounding areas. The third Falcon Heavy delivers another cargo lander to low-Earth orbit. This carries a fully fuelled Lunar Excursion Vehicle (LEV). Similar in nature to the Apollo LEV, this combines a habitat module and a propulsion module capable of lifting the habitat module (and crew) up from the lunar surface and back to Earth orbit at the end of their mission. It is followed by the launch of the lunar crew aboard a Falcon 9 rocket and Dragon capsule. The crew transfer to the LEV on the cargo lander, leaving their Dragon in a parking orbit. The cargo lander then flies them to one of the pre-set landing zones on the Moon. Once there, they complete operational set-up for the base and transfer living to the habitat unit. Zubrin recommends using the lunar poles as a destination – as he points out, they are largely bathed in sunlight, while craters can remain in deep shadow, allowing water ice to potentially exits within them. This can be mined using the microwave beaming system, and transferred to the electrolysis/refrigeration unit where it can be used to create oxygen and hydrogen. Stored in the fuel tanks of the two cargo landers, these can be used as propellant feedstock, as well as the hydrogen being used in the fuel cells powering the crew’s rover vehicles, and the oxygen to replenish the atmosphere of the habitat unit. At around US $100 million per launch for the Falcon Heavy and US $60 million for the Falcon 9, it is liable that the initial mission costs – including development of the lander, habitat, LEV and other surface equipment – would be well within NASA’s current budget, and a human presence could, after initial deployment of the lunar base units, be maintained for US $160 million per mission using the single habitat unit. What’s more, the base could be periodically expanded for a further US $200 million per expansion – the cost of adding each new habitat module and its associated power units. 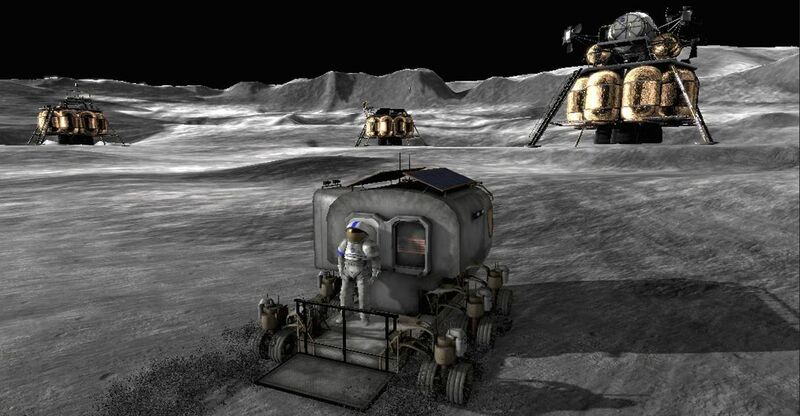 Nor would astronauts be limited to just exploring the areas of the Moon within range of their surface rovers; the LEVs could be used to “hop” further afield on the lunar surface, replenishing their fuel tanks using the propellants harvested from mining water ice. 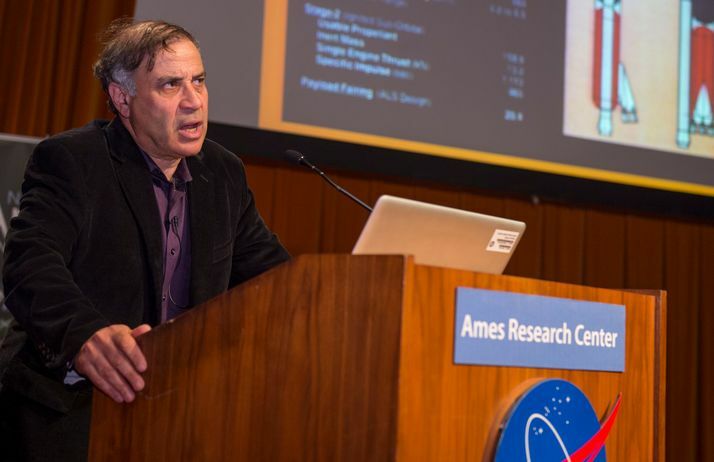 Zubrin’s proposal is bold, ambitious – the four-year time frame perhaps a little too ambitious. It also offers a pragmatic approach to leverage existing capabilities to achieve a cost-effective return to the Moon. But – will it be considered by the powers that be? Probably not. Earlier in March, I reported that the James Webb Space Telescope (JWST) was likely to be subject to further delays in its target launch date. The delays were proposed by the U.S. Government Accountability Office, after an assessment revealed the four months of schedule reserves – periods of time put in place so that unexpected issues could be dealt with without threatening the launch date which had been the reason for delaying the launch until May or June 2019 – had almost been used up. 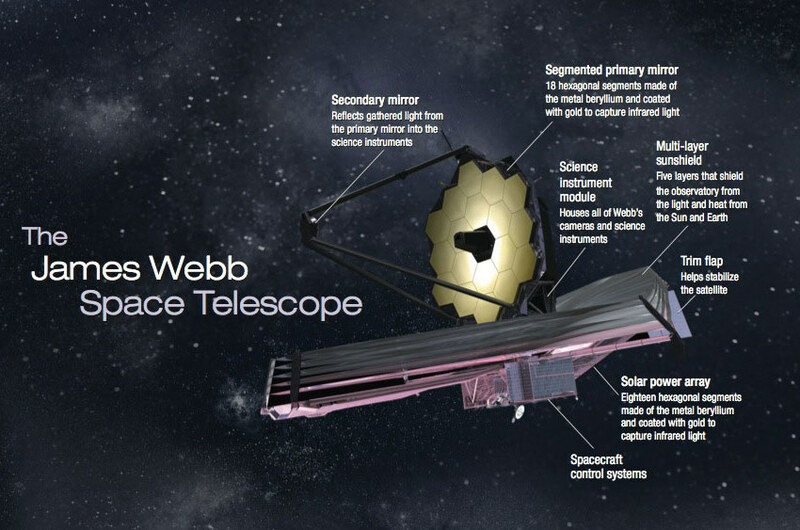 Now, the Standing Review Board (SRB) for the project has assessed the remaining pre-launch tasks that have to be completed, and passed a recommendation that JWST’s launch should be moved to at least May 2020. These remaining tasks consist of integrating the combined optics and science instruments onto the spacecraft element, then testing them to ensure that they will deploy properly and work once they are in space. An external Independent Review Board (IRB) has additionally been formed to further assess the project’s progress and the remaining tasks on the schedule, and the findings from this board will be used to determine a more precise launch date.